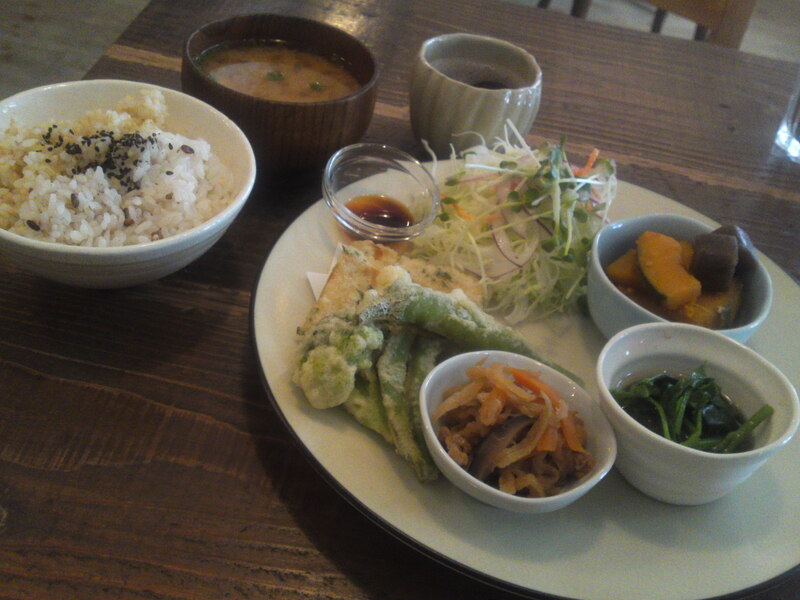 Vegan & Vegetarian Restaurant: Locomani in Shizuoka city! 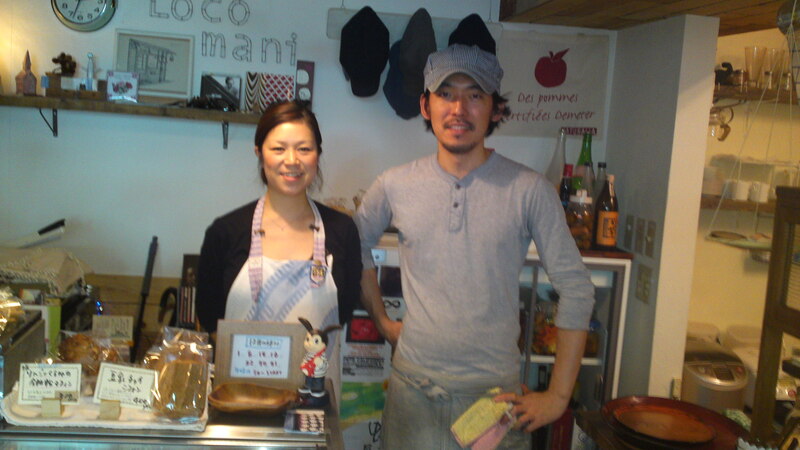 When Shigeyuki Aoshima/青島茂幸 (40) and his wife Hiroko/寛子 (38) opened Locomani in Takajo Machi, Shizuoka City in June 2008 they were on a mission: create healthy food for all and mainly from Shizuoka products. At first they served vegetarian and omnivorous meals, but later moved to vegetarian food only to finally offer exclusively vegan gastronomy last year. 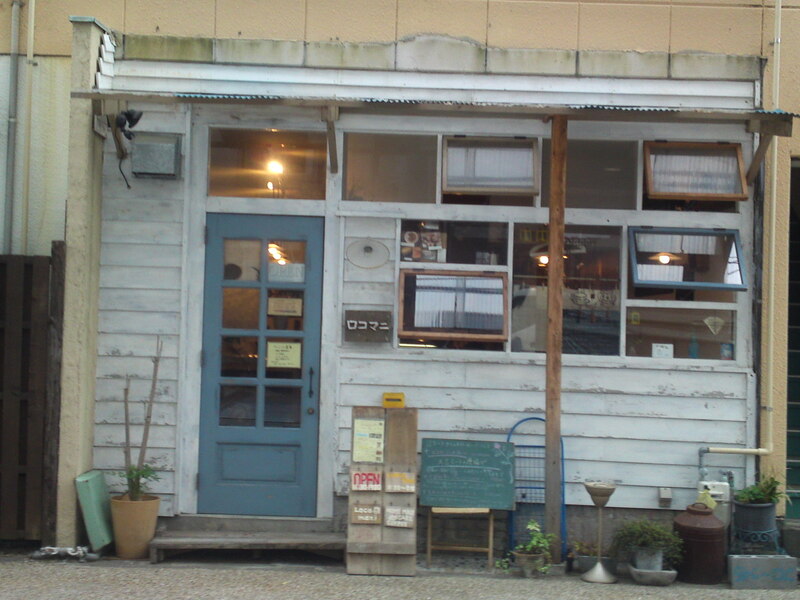 Their restaurant/cafe is a very cozy place all wood and country decoration, a warm place to enjoy slow food at lunch or early dinner or a little haven for a quiet drink and a book or friend. My favorite seat at the counter along the kitchen! 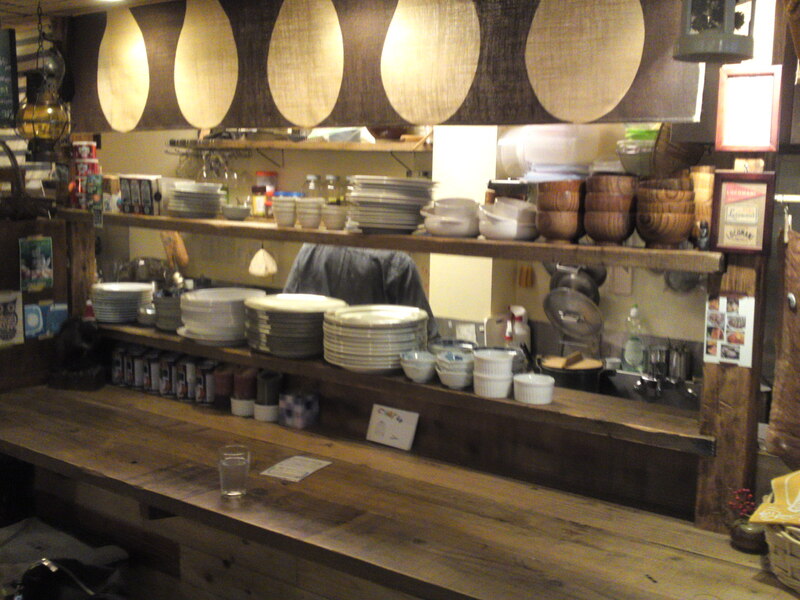 Their menus are exclusively seasonal thanks to their many farmer friends and the mild climate of Shizuoka allowing for a steady supply all year round! Instead of lengthy explanations the following pictures I took over the years should give you a good idea of what you can enjoy there! 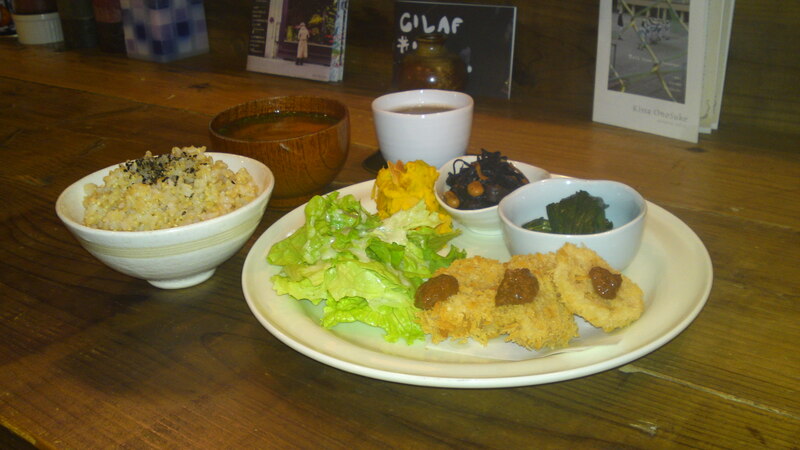 Vegetarian kuruma fun katsu/車ふんカツ lunch set. 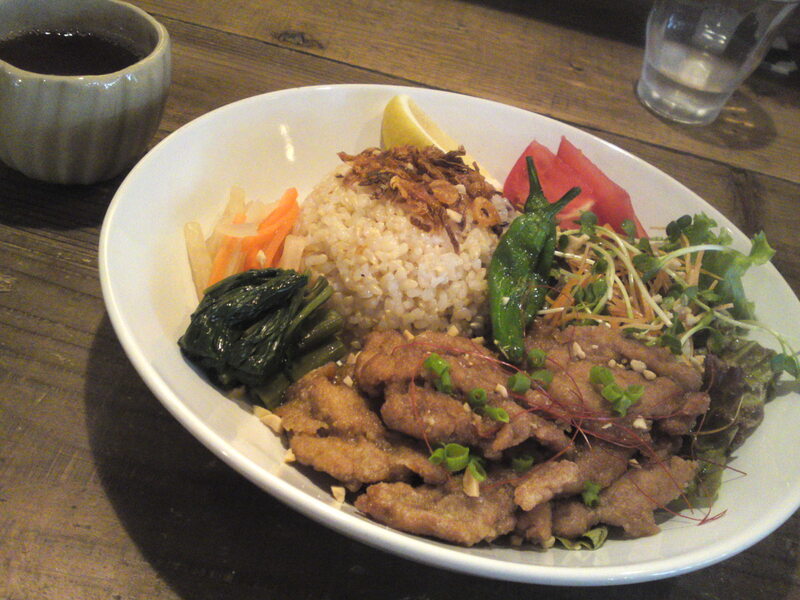 The katsu/cutlets are vegetarian and served with an apple and miso sauce! 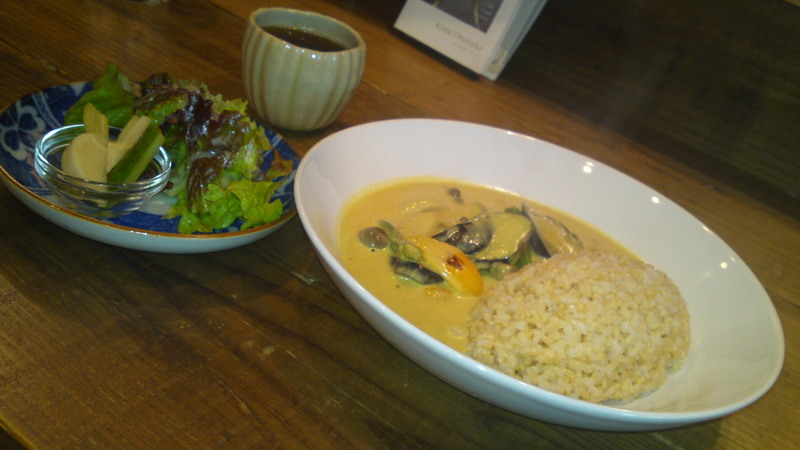 Organic vegetables curry set. This very tasty curry is practically vegan as they use coconut milk! Vegan/vegetarian lunch set with a few intriguing ingredients! 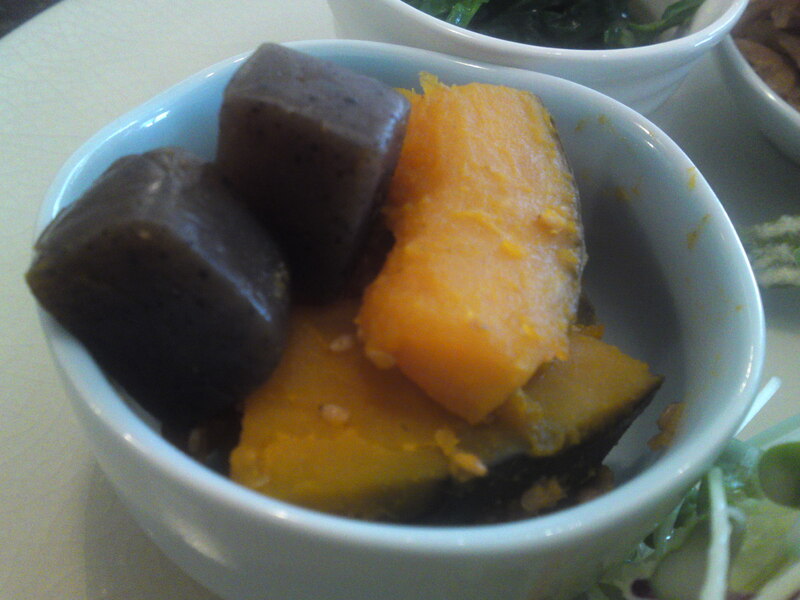 Boiled kabocha pumpkin and konyaku/elephant’s foot tuber jelly! 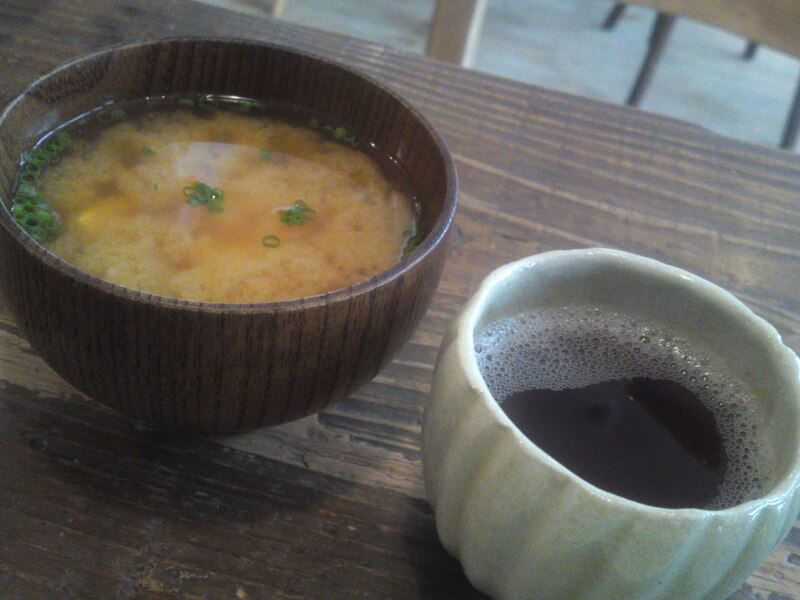 Vegetable and tofu miso soup and 3-year old organic tea. 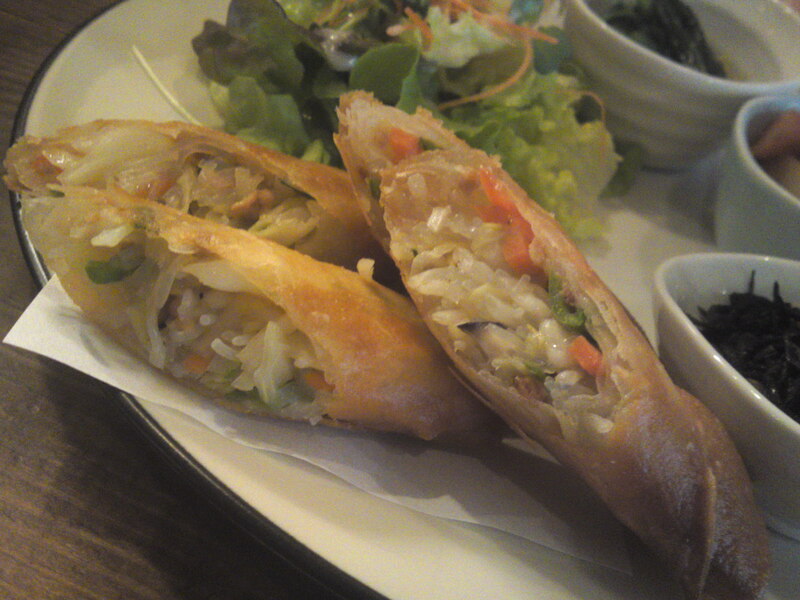 Crunchy and juicy deep-fried vegetable Imperial rolls! 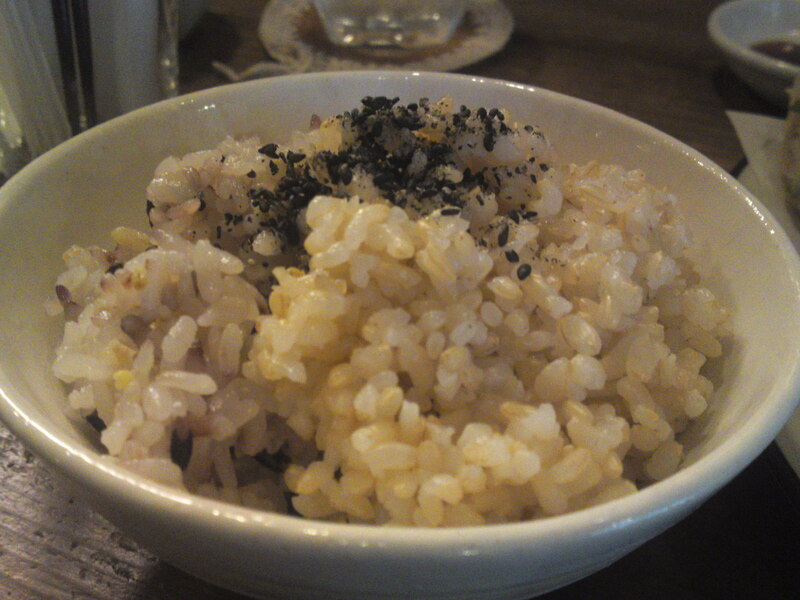 Rice can be either plain white or genmai/whole. Try the combination of the two! 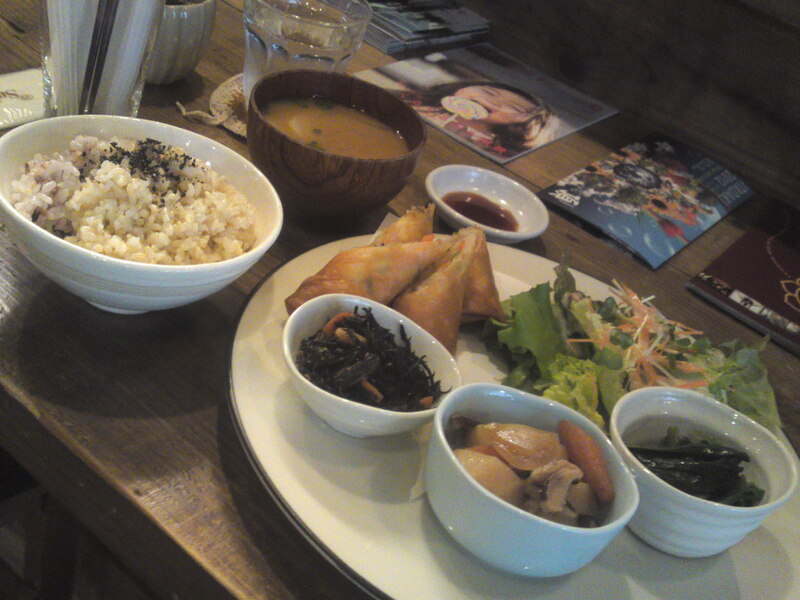 The whole concept is vegan, although the “soy bean meat” really looked, tasted and crunched like meat! 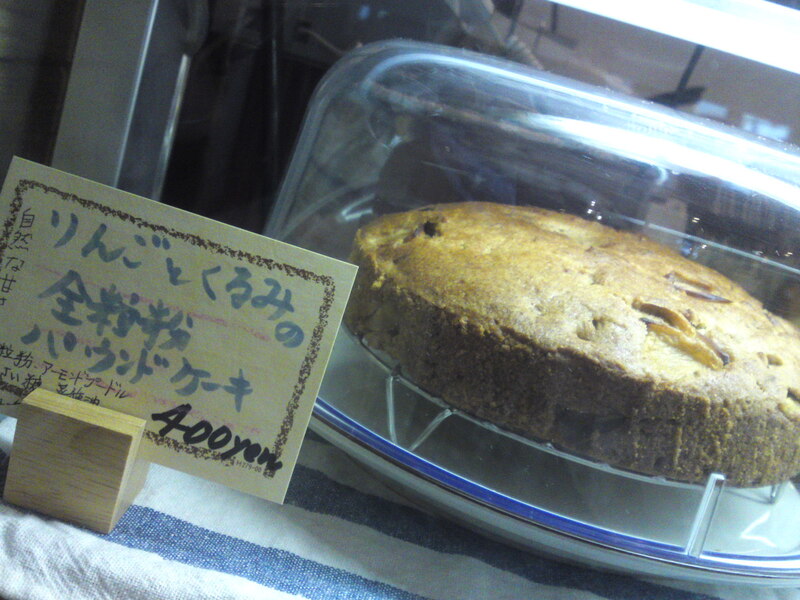 Apple and walnuts pound cake made with rice flour for the finishing touch!